AN ACT relating to the prohibited administration of certain vaccinations. 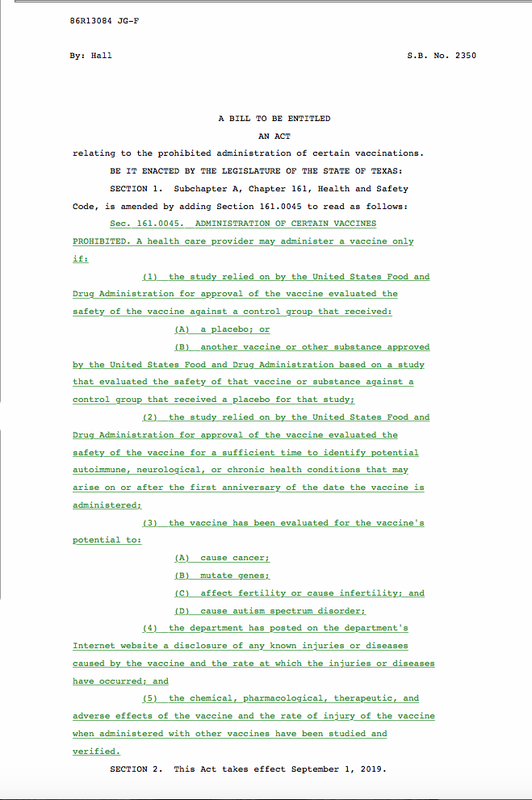 AUSTIN, Texas (TAC) – A bill introduced in the Texas Senate would prohibit vaccines from being administered unless certain safety criteria are met. Passage of the bill would significantly strengthen vaccine safety testing requirements and push back against any future federal vaccine mandates. In the absence of pharmaceutical industry liability for most vaccines, the number of vaccines recommended by the industry and the CDC is steadily rising. For example, in 1983, the CDC recommended that children receive 23 doses of seven vaccines. By 2017, the number of vaccines it was recommending rose to 69 doses of 16 vaccines starting on the day of birth to age 18, with 50 doses of 14 vaccines given before age 6. Since 2002, a CDC adult vaccine schedule has also existed. Like with the childhood schedule, the number of recommended vaccines and doses on the adult schedule has continued to rise. Furthermore, there are hundreds of new vaccines in the developmental process and the number of CDC recommended vaccines is expected to continue to rise. Lack of adequate safety testing is a common concern of opponents of mandatory vaccines and SB 2350 addresses this critical issue. In fact, there is a multitude of reasons, in addition to inadequate safety testing, to question the mandating of vaccines. For example, the ingredients in them are often cited as a source of concern. The ingredients in each type of vaccine differ but, generally, vaccines contain a myriad of toxic or concerning substances such as aluminum, antibiotics, formaldehyde, Polysorbate 80, bovine extract, egg protein, monosodium glutamate (MSG), squalene, and aborted human fetal tissue. , . Additionally, several recently published books set forth scientific information which raises concerns about vaccines, including the book Miller’s Review of Critical Vaccine Studies: 400 Important Scientific Papers Summarized for Parents and Researchers by Neil Z. Miller, which contains over 400 peer-reviewed scientific studies. In another book, Vaccines – A Reappraisal, Dr. Richard Moskowitz, a family physician with over fifty years of experience, discusses a wide range of troubling information concerning vaccines, such as: epidemiological research which indicates that vaccines may interfere with the normal development of a healthy immune system; information concerning the role that vaccines can play in causing infectious disease outbreaks; and evidence of the surprisingly low effectiveness levels of many vaccines. J.B. Handley’s book How to End the Autism Epidemic also contains a wealth of information concerning potential harm caused by vaccines, particularly focusing on aluminum, a toxic metal used as an adjuvant in many vaccines, and on evidence of a causal link between vaccines and autism. As these works clearly indicate, the science is not settled with regard to whether vaccines are safe or necessary. Federal regulation becomes ineffective when states enact contradictory policies. 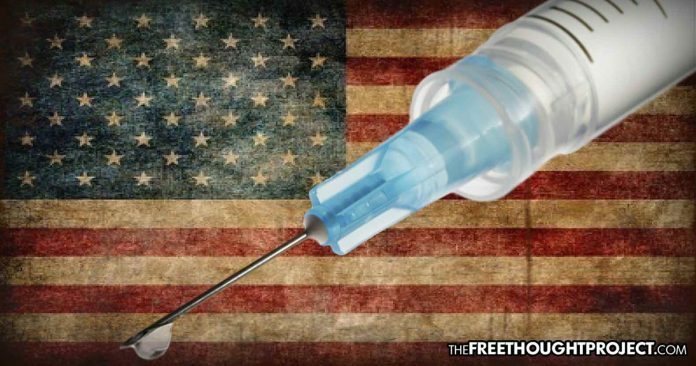 If multiple states ban mandatory vaccinations or pass laws which conflict with the CDC’s recommended schedules, it will become extremely difficult for the federal government to enforce future federal mandates. Such state laws will also undermine the federal narrative and make it harder for the feds to generate support for nationwide mandatory vaccine policies. By passing SB 2350, Texas has the opportunity to lead on this important issue and to become the potential standard bearer for resisting federal vaccine policy at the state level. Cohen, Elizabeth and Bonifeld, John, “FDA chief: Federal government might step in if states don’t change lax vaccine laws.” CNN.com. Cable News Network. Web. 20 Feb 2019, https://www.cnn.com/2019/02/20/health/vaccine-exemptions-fda-gottlieb/index.html. Accessed 7 April 2019. Children’s Health Defense. “$4 Billion and Growing: U.S. Payouts for Vaccine Injury and Deaths Keep Climbing.” www.ChildrensHealthDefense.org. Web. 19 Nov. 2018, https://childrenshealthdefense.org/news/4-billion-and-growing-u-s-payouts-for-vaccine-injuries-and-deaths-keep-climbing/. Accessed 7 April 2019. Berensen, Alex, “Jury Finds Merck Liable in Vioxx Death and Awards $253 Million.” nytimes.com. Web. 19 Aug. 2005, https://www.nytimes.com/2005/08/19/business/jury-finds-merck-liable-in-vioxx-death-and-awards-253-million.html. Accessed 7 April 2019. National Vaccine Information Center. “A Guide to Reforming Vaccine Policy and Law.” www.nvic.org. Web. 26 Sept. 2018, https://www.nvic.org/Vaccine-Laws/state-vaccine-requirements/Reforming-Vaccine-Policy—Law-Guide.aspx. Accessed 7 April 2019. Centers for Disease Control and Prevention, Immunization Schedules, Table 1. Recommended Adult Immunization Schedule for ages 19 years or older, United States, 2019. Web. 5 Feb. 2019, https://www.cdc.gov/vaccines/schedules/hcp/imz/adult.html. Accessed 7 April 2019. Robert F. Kennedy, Jr. “Vaccines and the Liberal Mind.” Children’s Health Defense. www.ChildrensHealthDefense.org. Web. 14 June 2018, https://childrenshealthdefense.org/news/vaccines-and-the-liberal-mind/. Accessed 7 April 2019. Imus, Deirdre. “Toxic Vaccine Ingredients: The Devil is in the Details.” www.ChildrensHealthDefense.org. Web. 6 March 2018, https://childrenshealthdefense.org/news/toxic-vaccine-ingredients-the-devils-in-the-details/. Accessed 7 April 2019. National Vaccine Information Center. “New Human Fetal Cell Lines Available for Vaccine Production.” www.nvic.org. Web. 15 Jan. 2018, https://www.nvic.org/nvic-vaccine-news/january-2018/new-human-fetal-cell-lines-for-vaccine-production.aspx. Accessed 7 April 2019. Thank you to VG for sharing this article with us @ ZEROVAXX!